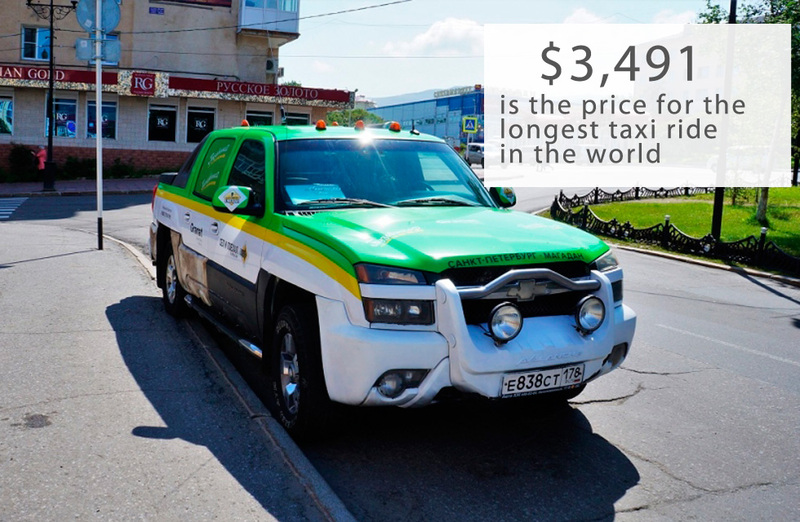 Number of the week: How much does the longest taxi ride in the world cost? Russian traveler Nikita Arkhipov, a participant of the expedition, Sit and Go to Magadan, went from one side of Russia to the other, traveling 7,767 miles from St. Petersburg to Magadan with the company Taxovichkoff. He paid 233,013 rubles ($3,491) for the ride. This journey set a new world record in terms of trip time according to the local news portal Magadanmedia.ru. It took Arkhipov a month to reach Magadan. According to the organizers of the expedition, one of the goals of the trip was to popularize active tourism in Russia among the wider population.